OMG! I just found the most incredibly cute clothesline baby shower invitations ever. ​I had to show you right away. Amirite? The design is so unique and yet trendy with it's cute hanging girly clothes including a dress and swimsuit. It's also got a pink polka-dot background with clouds and an adorable baby, teddy bears, and birdies. ​The flip side houses all of the important personalized baby shower information and another cute teddy. The adorable boy's version is equally appealing but has a blue polka-dot background and the clothes hanging and more masculine. ​There's also a little train running along the top of the clothesline and a couple of teddies and giraffes. 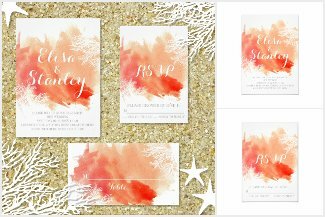 ​Both invite designs measure 5.25" x 5.25", come complete with a white envelope and can be ordered in multiples of as few or as many as you like. These trendy tribal arrows baby shower invitations will be the talk of the town when you choose them to invite friends and family to get together to honor the modern mother-to-be. Tribal arrows adorn both the front and backs of the card. Created using gorgeous shades of gender neutral pink AND blue, these 5" x 7" invites can be used for either a girl or a boy. ​Use this stylish, chic design at any time of the year. They're easy to personalize with all of the party info. They come with an envelope for mailing AND Zazzle's 100% satisfaction guarantee. ​Buy in bulk to save big.